Although sales from most luxury goods are down Cuban cigars sales are up by 5%. Why? There's a lot of daylight between the passion people have for cigars and other luxury goods like shoes and jewelry and its that very difference that is fueling the entire cigar industry (passion). Furthermore, Americans are visiting Cuba in droves which is driving the sale of Cuban cigars through the roof but soon the thrill of a taboo product will dwindle as Americans discover that the cigars they have always had available to them were just as good or better than the forbidden fruit they have mythologized. 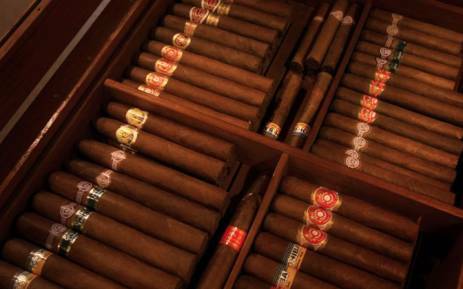 HAVANA – Sales of Cuba's legendary cigars rose 5% last year to $445 million, defying stagnation in the global luxury goods market, manufacturer Habanos SA said on Monday at the opening of the Caribbean island's annual cigar festival. Habanos, which makes brands including Cohiba, Monte Cristo and Romeo y Julieta, said it expects moderate sales growth this year as it continues to tap the Middle East, Asia and other new markets. "We are quite happy we were able to grow during a year that was in truth quite challenging," Vice President of Development Javier Terrés told Reuters after holding a news conference hazy with smoke as journalists puffed on complimentary cigars. Cuba's monopoly cigar company was kicking off the festival that attracts wealthy tobacco aficionados and retailers from around the world for five days of extravagant parties and tours of plantations and factories. Habanos dominates the global market for hand-rolled, premium cigars except in the United States (US) due to Washington's half-century trade embargo against Cuba. The United States is the world's biggest cigar market. American enthusiasts have had slightly better access to Cuban cigars since former President Barack Obama two years ago unveiled a Cuba policy aiming to normalize relations. Last October, the Obama administration removed limits on the amount of cigars American travelers could bring home. Terrés said this made little difference to overall sales but it would help brand recognition in the US. Wholesale shipments there would require the US Congress to lift the embargo, a move that looks uncertain under President Donald Trump, who has threatened to reverse the detente. Still, better US-Cuban relations have helped stoke a boom in tourism, which in turn has lifted cigar sales in Cuba, according to Habanos. The number of visitors to the island rose 13% last year. "Our sales in Cuba are directly related to tourism, and in effect, sales in Cuba have grown," Terrés said. Habanos said its traditional European markets had remained stable last year, while there was growth in emerging markets like the Middle East and Pacific Asia. Meanwhile, female smokers remain a largely untapped market for Habanos, Terrés said. The company is working on it but has learned that producing smaller, milder versions of its classic cigars is not the answer. "Actually, women want to smoke big cigars and enjoy them like a man," he said, adding it was important to draw in women with specific promotional events.